Let's have another stroll down memory lane...childhood toys! I was born in 1965, so my memories would be toys from the 70's. GI Joe Camper...I know Gi Joe? My dad was in the army. I did have a Barbie in the camper too! What are some of your favorite childhood toys or memories with them? I love reading posts like these, especially from other parts of the world. All our similar memories really make the world a smaller place. I was born in 65 too. I remember spending hours playing Ker Plunk when I was a kid. You can buy it now but from what I read, the quality isn't very good. I wish I still had the one from when I was a kid. Oh my gosh yes! I was just wondering last week about where I could get a spirograph again! I was thinking...I remember all of these, then I read your post. I was born in 64 and recognize all of these, but you forgot the Barbie Dream House with the elevator: http://www.apartmenttherapy.com/the-evolution-of-the-barbie-dr-79515 Except I don't remember it looking so flimsy...I thought it was the greatest thing ever! I was born in 1967 and my sister was born in 65, so we had some of the same toys. I had that exact light bright. Mine did not come with red pegs! It wasn't until a year or so later when I had saved my allowance and found a set of replacement pegs that I got the red. Maybe that is why red is my favorite color? Hmm. Anyway, we had the sprirograph, too, and I had two different barbie campers. Quite often I would put a box on their tops and use it as a baby doll buggy. We also had "romper stompers." They were fat yellow cups that your stood on with bright green handles. You walked around on them. They always hurt the bottoms of my bare feet. I also had the large red ball with the handle. You bounced on it. At least, I had it until my mom ran over it with the car and popped it. But it wasn't my fault, I'm sure!! But whatever toys I did have could not compare with the ones filling the Christmas catalogs! Wasn't it the best ever to lay on the living room floor and circle everything you wanted for Christmas? OMG - I had that too. I had completely forgotten about Fashion Plates. Thanks for the reminder. 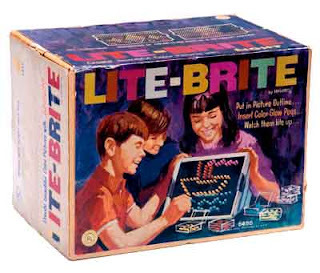 I was born in '61 and always wanted a light bright but never got one. Instead I had Liddle Kiddles, Goody Two Shoes, Buffy and Mrs. Beasley, Crissy, Dawn dolls and of course Barbies. My brother had Johnny West, GI Joe and confiscated my Gary (from Dawn line)and put electrical tape around his privates. What was up with that? We played a lot of Monopoly with my parents along with 500 Rummy. Of course we had all the safe toys like lawn darts with the points and our bicycles with the sissy bars. We played outside a lot too playing kick the can, statue, hide and seek, kickball. Didnt you just love opening your new doll up for the first time? You dont forget that smell. I remember some of those toys. 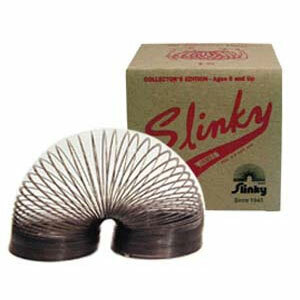 My older brother had the viewmaster, slinky and spirograph. I had a 'Giggles' doll (Ideal brand)- which really did giggle. Her mini-dress and pants were hot pink and orange striped. I also had felt boards on which you stuck on the felt shapes (animals, people, flowers). I had an icecream machine, (turned by hand) which took quite a while to make the icecream, but one day, to my horror, I found my brothers mixing 'concrete' in it (and it was ruined!! )I remember having a 'shaker maker' too. I loved the Suzy Homemaker stuff too. oh, lovely post. We used to have all of this here. Nice memories. Happy day to all. I was born in 65 too and remember all those toys! 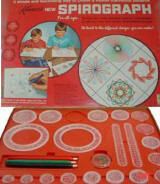 What memories.....I LOVED my spirograph! I dearly loved my Raggedy Ann and Andy dolls made by my mother! I also had that Light Bright and Spirograph. In my youngest days, I had Liddle Kiddles and a Suzy Homemaker Oven and Iron. I remember all the toys you listed, but didn't have any of them. I played with them at my friends who had them. I had dolls and stuffed toys mostly. The only Barbie I ever owned my mom bought at a garage sale. I don't know if my parents didn't want to spoil us kids, or maybe just couldn't afford those toys. We had crayons and paper and books mostly. I can remember my brother, who is 3 years older than me, got an Erector Set once. 65 must be a popular birth year for your blog....me too!!! How funny. I had most of those toys. My Barbie camper looked just like GI Joe's. The camper finally bit the dust after my children played with it. We painted it camouflage! I still have all the accessories. I still have my spirograph, we use it! I had a jump rope thing you put on your ankle and swung it around. Crazy. I loved baby tender love, an oversize ballerina barbie, a baby that crawled and rode a bike, Chrissy with the growing hair and belly button shortener but my all time favorite was Baby Alive....she pooped her diaper after you fed her! All my dolls had pierced ears. We used to use my mom's sewing pins that had pretty balls on the end and make earrings. Big stuff back then, getting your ears pierced as a teen was so significant! My mom saved everything, I still have a lot of my toys. *sigh....a blessing and a curse. I had all those same toys except for the GI Joe camper. Of course my favorite is my Barbies. I still have them (does that sound silly?). I also have all my daughters Barbies. I did not have clothes that were bought in a store for my Barbies. All the clothes that I have for them my mom made!! I think that makes my Barbies even more precious to me. Thanks for the trip down memory lane! My kids have all those toys in my basement. I was born in 50 and played with them also so when I became a mom I made sure my kids had some of my favorites to play with. I do recall all those toys, but I was born in the late 40's. My favorite was my collection of Ginny dolls and their clothing and the wooden furniture they had. I also was a big book fan and read all the Bobbsey Twin and Nancy Drew books as they came out. I saved the viewmaster and reels that my kids have and my grandkids enjoy looking at them...saved their Barbie's too. I remember....I think, that swinging jump rope style thing...it was called a Lemon Twist. You put one foot in, swung it around and jumped over it. I was born in '73 and my sister was born in '76. I remember we had a kitchen set that my parents said took all night for "Santa" to put together but boy, we played with that thing for years so I think they got their monies worth. I had the Baby Alive doll and I remember getting a new one several years in a row - don't know if I was just so rough on them or what. We had the big ballerina doll where you push the crown down on top of her head and she would twirl around. Oh, and yes, can't forget the Fashion Plates! Then you've got the toys that are making a comeback and my daughter is playing with them now...Strawberry Shortcake, Care Bears, etc. Thanks for bringing back the good memories! I was born in '63 and had forgotten about these toys until you posted. I too played with all of these. Thanks for the trip down memory lane. I was born in 62, the 4th of 8 children. All these toys were part of our childhood and bring back such wonderful memories! 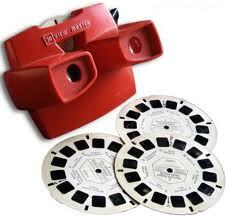 I actually had a TALKING view master! What do you think of that? It was the envy of every other kid on the block! And stilts! I put a lot of miles on my stilts around our neighborhood! Lite Brite is still a favorite for my own children! I was born in 64 and remember all those toys. Just didn't have the GI Joe camper but I still have all my barbies. I was born in 64 and my sister in 65. We had a ton of Barbies, and my mom made all of their clothes. We also had Baby Alive. Remember those? You would feed them and give them a bottle, and they would really wet and poop. I thought that was so cool back then. I had a hand-me-down Etch a Sketch and a View master with one set of Winnie the Pooh disks. I desperately wanted one of those bouncy things that looked like a giant rubber ball with a handle that you sat on and bounced around. Never got one. My parents said I could play on my friend's. I loved playing Connect Four and Battleship with my dad. Don't forget the Mattel Vacuform (one of my favorite toys) and the Easy Bake Oven. Like Pat I was born in the mid 40s. Still have all my Bobbsey Twins books and my original view master (it was dark brown). I also have my husband's Hardy Boys books and his wooden Brio train set (the one that led to Thomas). The tracks go together with nails. Didn't anyone have a hoola hoop? I think my sibs and I we had all the above toys. I remember one Christmas getting what seemed at the time life size Raggedy Ann and Andy (still have them tucked away). I also had a Tippy Toes Doll, that took batteries and she could walk or ride her bike. (well kind of) Mrs. Beasley is still around too, but my brother coloured in some of her spots!!! argh. Easy Bake Oven had lots of use too. Funny thing, I bought most of these toys for my kids one Christmas and called it a Retro Christmas. Oh course the quality wasn't the same. did any of you have a Krazy Kar/Big Wheel? yellow saucer like thing with two big red wheels that you could spin around in. That was cool. I was born in '62, and had the Spirograph set. Loved it! We never had any dolls (4 girls in our family....what's up with that! ), but we had Tonka trucks (1 brother.....sheesh!....he got everything! lol) and we had pogo sticks and stilts, and we'd mostly play outside. I remember something called Ga-nip Ga-nop, and it was 2 acrylic balls attached to strings on a loop, and you whipped it back and forth and the balls smacked each other, but would get in a wild rhythm and you had to hold it at arms length not to get smacked! Cripes! That would never pass kid-friendly now! lol We also had a gyroscope on a wired paddle thing, and you could sit all day twirling it up and down on that wire thing. I think we got it cuz my parents thought it was 'scientific'! lol We also had every board game known to man' I learned all about art from a game of Masterpiece, and we played cards almost every night after dinner.....hearts mostly! For my sister's 50th bday, we gave her most of those toys! Plus Twister, Old Maid, and Barrel of Monkeys! She and I would spend HOURS with spirograph and Mattel's Creepy Crawlers! 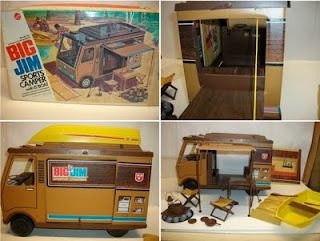 I was born in 73' but I had nearly all the same toys except for the camper. I had a Barbie Motor home. I still have the view master with Beverly Hill Billies reels and the Moon Landing also. Still very to cool to "View" once in a while. I was born in '48 and my kids played with all these toys. I also loved Silly Putty, and Betsy Wetsy. Barbies were just coming into 'vogue' when I was outgrowing dolls. I made up for that by buying Barbies form my daughters and made clothes for them too. Since the only neighbors I had to play with were 2 boys, we played cars and trucks. I had a "serious" Tonka road grader.. those were the days . .
My Barbie doll and the Viewmaster, both of which I still own. 70's were my 'toy' years as well. 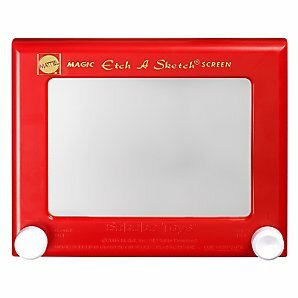 I liked the Etch-a-Sketch, a metal barbie doll house, and always wanted a play oven for baking up little cakes :) They were just becoming popular. I am just a couple of yrs older and remember all those toys, but loved my Easy Bake Oven, Slinky (we lived in a 2 story house and i was fascinated how it would walk down the steps) and my baby doll Thumbelina! What fun Thanks! Shovel for digging swimming hole in backyard...Grandpa saved us before we jumped off the ladder into the hole. Loved Spirograph and etch a sketch-they were the best! My sisters loved Barbies-yuck, but I loved my Chrissy doll-the one who's hair got longer or shorter when you pushed her belly! Oh!! Another trip down Memory Lane! Thanks, Karen!!! But mainly remember playing outside: hopscotch, jump-rope, Giant Step, 123 Redlight, tag, ball-games like 7-Up, Red-Rover, Statues, bike-riding on my banana-seated bike!, "chinese" jump-rope, simon-says, and much loved Hide & Seek! WOW, we knew how to have fun! And, just laying in the grass, looking up at the clouds rolling by. Catching fire-flies in a jar. The search for that perfect rock to use in hopscotch....a flat one that wouldn't roll too much! Or, how about rolling down a hill?? HAHA! And in the winter, many other fun things were in store for us.